Marijuana company Verano Holdings has raised $120 million in financing to fund expansion in Illinois and other states. Verano is a newly formed Chicago-based holding company that consolidates ownership of several cannabis operations, including Illinois-based Ataraxia, which has a cultivation facility in downstate Albion and three dispensaries in the state. The round of funding comes at a time of rapid movement among Illinois-based medical marijuana companies. In just the past month, one company announced plans to go public on a Canadian stock exchange, and another firm is set to be acquired for nearly $700 million. Some of Verano’s funding will help fuel an expansion underway at the Albion facility after Gov. Bruce Rauner signed legislation this summer that allows people prescribed opioids to use medical marijuana. The expansion will triple the facility’s capacity by January, Verano CEO George Archos said. Verano also plans to expand its dispensary in St. Charles to include more consultation space, Archos said. The industry already is seeing increased interest from potential patients in the wake of the opioid law, he added. Even before Rauner signed the law, Illinois growers began to expand as more patients got access to medical marijuana through the pilot program. A state report out earlier this month found that use of medical pot has risen 83 percent this year in Illinois, which has more than 46,000 qualified patients. Before the new law, patients had to have one of about 40 conditions, such as cancer or AIDS. Verano, which employs about 125 people in Illinois, plans to hire 30 to 40 more people in the state in the next two months, Archos said. Nationally, it plans to hire hundreds in the next year. “It’s growth in the industry as well as the new markets that we’re entering into,” Archos said. Verano also announced Tuesday that it acquired Florida-based cannabis company 3 Boys Farms. With the acquisition and consolidation, Verano owns or manages four cultivation facilities and six dispensaries in Illinois, Florida, Maryland and Nevada. It also owns or manages more than two dozen licenses for operations being developed in Florida, Michigan, Ohio, Maryland and Puerto Rico. 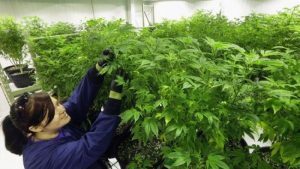 Verano’s investors include Toronto-based Scythian Biosciences and Markham, Ontario-based Serruya Private Equity, both of which have a history of investing in marijuana companies. The financing follows several major moves from other Illinois-based marijuana companies. Chicago-based Cresco Labs announced earlier this month that it raised $100 million in private funding and is moving forward with a plan to go public in Canada. It follows Chicago-based cannabis company Green Thumb Industries, which debuted on the Canadian Securities Exchange this summer and helped cement investors’ interest in the industry. Additionally, prominent cannabis firm MedMen Enterprises agreed to pay $682 million for Oak Park-based medical pot company PharmaCann.